On 30 of May and on 1 of June T8 company traditionally took part in the largest conference for technological entrepreneurs Startup Villageas an exhibitor. The event took place in Moscow on the platform of Skolkovo Innovation Center. Deputy Prime Minister Maksim Akimov, the curator of national program ‘Digital economy’, and Vnesheconombank Chairman Igor Shuvalovbecame the guests of honour of T8 company exposition. T8 demonstrated them a new high-speed 400 Gbit/s transponder for telecommunication DWDM-platform Volga operating on one carrier wavelength. T8 is the first among European companies who succeed to develop such a device. In addition to the telecommunication equipment, T8 also represented to guests a distributed fiber optic sensor system Dunay. This advanced sensoruses neural network technologies in its work. Problems of developmentof Russian-origin telecommunication equipment production were discussedduring the visit as well as problems of support from state banks during the work with Russian customers. 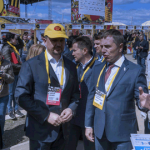 Startup Village (www.startupvillage.ru) is the most large-scale startup conference in Russia and the CIS countries for technology entrepreneurs, organized by the Skolkovo Foundation in collaboration with the Foundation’s partners. Startup Village is unique platform where startup founders and innovators meet successful entrepreneurs, investors, large technology corporations, and representatives of city administration to discuss technological trends, ideas, and the nurturing of the next generation of Russian entrepreneurs. This global event annually brings together thousands of participants from all over the world.